The owner of Penporium is very concerned about the ability to write. and is looking for the most comfortable pen in the World? Do yourself a favor and try this pen - You will Not be Dissapointed! Everyone can benefit from using Dr. Lee's Ultimate Grip Pen. The UGLee Pen was designed for every hand, from big to small. It doesn't matter if you write all day or if you only write for five minutes a day. After using the Ultimate Grip Pen by Dr. Lee, you will never want to use another pen again! It doesn't matter if you write all day or if you only write for five minutes a day. After using the Ultimate Grip Pen by Dr. Lee, you will never want to use another pen again. 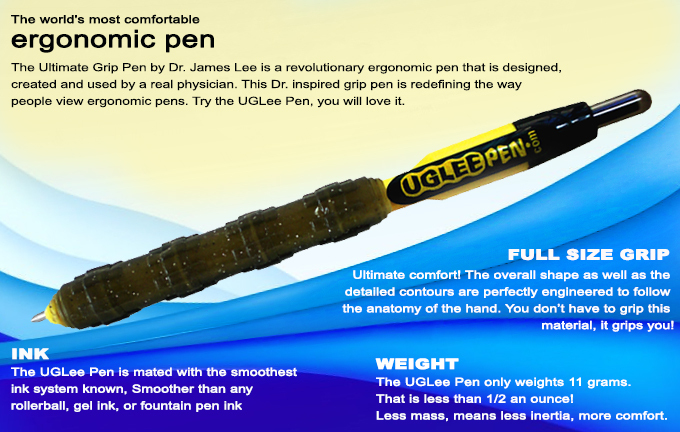 UGLee Pen, (which stands for “Ultimate Grip” Lee Pen) is considered the world’s most comfortable ergonomic pen. Designed by physician Dr. James Lee, the UGLee Pen was created by studying hand anatomy and researching the attachment and function of hand muscles to design the perfect grip, so, it actually is ergonomically designed! This Dr. inspired grip pen is redefining the way people view ergonomic pens. Try the UGLee Pen, you will love it.